At 2:30 p.m. on Friday, March 24, Student Government will thank the Schmitt Foundation representatives and then go outside to hear the bells ring for the first time. All members of the RIT community are invited to stand with the group at 3 p.m. outside of the Interfaith Center to hear the bells ring. The sound of the RIT carillon bells will be heard throughout campus for the first time in nearly three years on Friday. In the fall of 2014, the old carillon bell system played for its final time. The system, which was over a decade old and had a life expectancy of approximately that, broke. It wasn’t until the fall of the following year that students began asking for the chiming of the bells to resume. In late 2015, Student Government began drafting a PawPrints petition to Student Affairs, addressing the absence of the bells and asking that the system be replaced. Student Government president Andrea Shaver said that the movement gained momentum in 2016. The carillon system at RIT, unlike traditional systems, is entirely electronic. The new system, which took about six hours to install, connects to speakers around campus and can be programmed to play a variety of songs. There are no physical bells. The bell system will chime on every hour beginning at 3 p.m. Friday and will toll the number of the hour, from 7 a.m. to 11 p.m.
“The bells really help to raise the spirits of many members of the community,” Shaver said. The installation of the new system was made possible through the generosity of the Schmitt Foundation, which has been a valued partner of RIT for more than three decades. 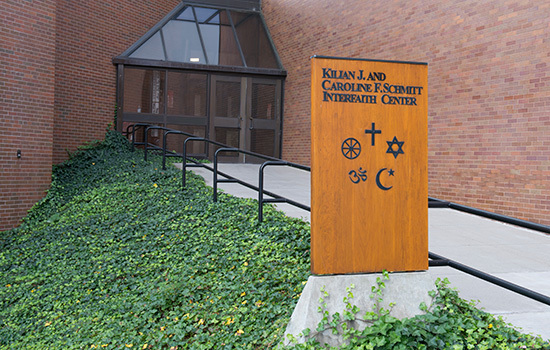 The Interfaith Center was initially made possible through the generosity of Kilian and Caroline Schmitt, two Rochester business owners who have since passed away. Jim Ryan, a representative of the Schmitt Foundation, said that when RIT reached out about necessary renovations to the Interfaith Center, the board was ready to listen. Ryan said that once the repair of the carillon system was identified as a need, it did not take long for the board to agree. “Kilian Schmitt had a great interest in music and he funded a number of similar initiatives in his lifetime, from the chimes at St Mary’s church downtown to the carillon and organ at Nazareth College to the organ in the Caroline and Kilian Schmitt Organ Recital Hall at the Eastman School of Music. Music and religion were very important to the Schmitts,” Ryan said.